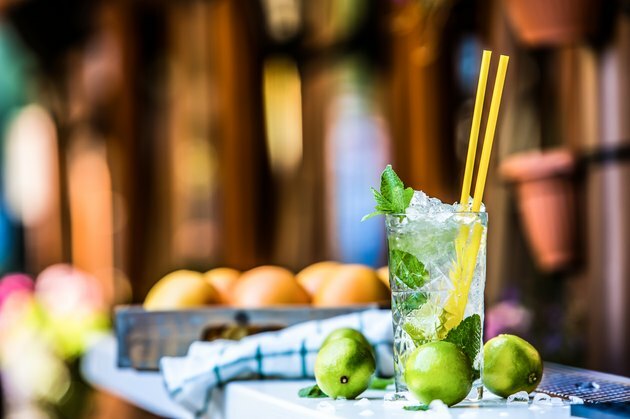 According to the United States Department of Agriculture, rum and vodka contain the same amount of calories, depending on "proof." The amount of alcohol in liquor is designated by proof – liquor that is labeled 80 proof has 40 percent alcohol by content. The USDA says that all 80 proof distilled alcohols have 97 calories in a 1.5 fl oz serving. CalorieKing lists some common rum varieties that are 80 proof, including Barcardi Gold and Myer's Rums. Common vodkas include Smirnoff Red and Ciroc. According to the USDA, all 86 proof distilled alcohols have 105 calories per 1.5 fl oz serving, including both rum and vodka. This alcohol level isn't common in the United States, but can sometimes be found overseas. Alcohols that are 90 proof have 110 calories in a 1.5 fl oz serving. Smirnoff Silver is a common vodka with this level of alcohol, as is Captain Morgan Parrot Bay.